Topic 1 Voting – an ethical issue? Topic 1: Voting – an ethical issue? Does a voter have an obligation to understand a politician’s or party’s policies before casting a vote? Should a voter consider the impact of a policy on others, or just on themselves? Should uninformed citizens be precluded from voting? These are tough questions! More than that, these are ethical questions. The way we vote can make people’s lives better, or it can make them worse. And they are questions to which people will offer opposing answers, which makes for an interesting exercise in giving reasons and listening to other perspectives. This Stage 3 topic begins with a story set close to home. It’s election time for the student representative council. Jen and Zac are both in the running, and it will be up to a class vote to decide who will be selected. How would you vote? Do you vote for someone because they’re your friend? Because they promise to get lollies back in the canteen? Does it even matter who you vote for, or if you vote at all? The topic goes on to raise the issues of political competence and compulsory voting in relation to a topic of global importance: the hole in the ozone layer. When scientists informed the world’s political leaders that the earth’s ozone layer was thinning, the leaders all agreed to ban the CFC gases that were causing it. Students are invited to consider what might have happened if, instead, governments had put the question of ‘should CFCs be banned’ to a vote. Each voter writes yes, no or maybe on a slip of paper and puts it in a cup. Pull them all out and tally up the results. Then, get a sheet of paper and divide it into three columns. Write ‘yes’, ‘no’ and maybe at the top of each. Together, try to think of as many reasons as possible for each side of the argument. Then ask each other, has anyone changed their mind? Why or why not? Why can’t children vote? Listen to the debate (and cast your vote!) in this Short and Curly podcast from ABC. What things count as punishment? Is punishment is necessary to deter people from doing the wrong thing? This topic invites students to think for themselves about the nature and aims of punishment; about why it is that, in our society, we seem unable to do without punishment, and whether there are alternatives to punishment. • Help students to think about why it is that our society needs the practice of punishment and what alternatives to punishment there might be. and JK Rowling’s character of Harry Potter. They were both able to make themselves invisible. That meant they could do whatever they liked without being caught or punished. Gyges did some terrible things (including killing the king!) Harry got up to some mischief, but mostly used his invisibility cloak to do good things. If you had the ring, and could make yourself invisible, so that no one could see that you were there and no one could punish you for anything you did, would you still have a reason to do what is right? Students are also asked in this topic to consider different scenarios where there is a consequence to a person’s actions, and to discuss which would be classed as punishment. Students are also asked to consider the strengths and weaknesses of different types of punishment, in order to think about how punishment can be made to fit the crime. Ask your child questions about the kinds of ways that children at their school are punished. • What kind of punishments might the principal give to children who do the wrong thing? • What about their own class teacher? • What type of behaviour results in these types of punishment? • Do you think that a punishment stops the child from reoffending? What makes you say that? • Do they keep other students from breaking the rules too? How can you tell? 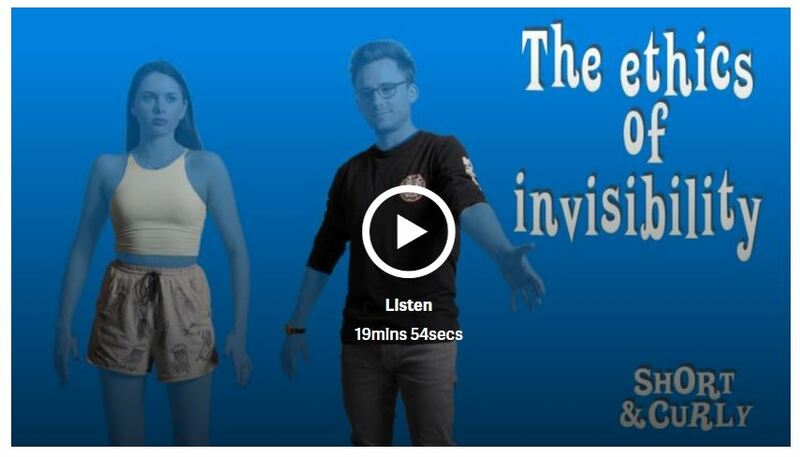 The ABC Short and Curly team explore these ideas in their podcast The Ethics of Invisibility.